HERNDON, Va., April 10, 2019 - With an even more dynamic look, the top of the TT model line - the 2019 TT RS - makes its U.S. debut at the New York International Auto Show. 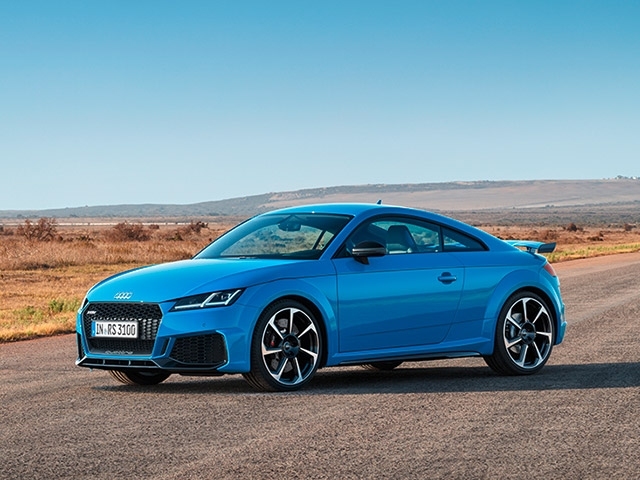 The refreshed TT RS Coupe includes redesigned front and rear fasciae, enhanced technology offerings and additional packages and trims, providing drivers increased personalization options. The refreshed TT RS has the most aggressive appearance yet, featuring a matte black Singleframe® grille with signature quattro script - now in matte titanium - giving the vehicle an even more dynamic look. Additional radiators located behind the honeycomb grille allow for improved cooling. The wide stance of the TT is underscored by lateral air inlets that now extend to the front wheel wells. A continuous front spoiler gives the car a lower, motorsport-inspired look. At the rear, the redesigned fixed rear wing spoiler and large oval tailpipes convey the vehicle's sporty DNA. The TT RS now comes standard equipped with 19-inch 5-arm design Audi Sport wheels in titanium matte finish with summer performance tires. A newly available Dynamic package includes 20-inch Audi Sport 7-spoke design forged wheels in titanium matte finish with summer tires, red brake calipers and a Sport exhaust system with black tips. Inside, the TT RS features a driver-oriented interior with intuitive, easy-to-operate controls and functions. With its heated, front Fine Nappa leather RS Sport seats with honeycomb stitching and deeply sculpted adjustable side bolsters, the TT RS is a sports car perfectly suited for all types of driving. In addition to the impressive aesthetics, the TT RS represents the Audi brand's advancements for in-vehicle technology. The standard Audi virtual cockpit, an entirely digital instrument cluster with 3D graphics, transforms the way the driver interacts with vehicle displays such as the tachometer and speedometer as well as navigation. Tech updates for 2019 include standard Audi phone box, which not only charges compatible smartphones wirelessly, but can also connect compatible phones with the vehicle's antenna to help optimize signal. Available Audi smartphone interface provides Apple CarPlay™ and Google™ Android Auto integration, making smartphone. The Bang & Olufsen sound system provides an excellent sound experience on board with an output of 680 watts. The 2.5-liter TFSI® engine of the TT RS delivers the distinctive five-cylinder sound that is unmistakably Audi and harkens back to the original turbocharged five-cylinder, the Ur-quattro. The unique 1-2-4-5-3 ignition sequence, which allows the ignition to alternate between the adjacent cylinder and those further apart, gives the TT RS its own rhythm. Generating 394 horsepower and 354 lb-ft of torque, the TT RS can sprint from 0-60 mph in class-leading 3.6 seconds. The power of the 2.5-liter engine flows through a seven-speed S tronic dual-clutch transmission that provides high levels of performance and acceleration. With the S tronic dual-clutch transmission, the TT RS also offers a launch control program that allows a heightened level of acceleration through precise engine speed and an automated clutch release. Standard quattro® permanent all-wheel drive has the ability to send nearly 100 percent of available torque to the rear wheels, and a traction control system, specifically calibrated for the TT RS, manages distribution for optimal acceleration with minimal slip.